Transgender cyclist Rachel McKinnon (centre) pictured with Jen Wagner-Assali (right), who called her victory "unfair"
Tennis icon Martina Navratilova has apologised for using the term "cheating" when discussing whether transgender athletes should be allowed to compete in women's sport. Navratilova - one of the most successful tennis players of all time - has been criticised as "transphobic" for writing that transgender women had "unfair" physical advantages over female opponents. On Saturday, former British swimmer Sharron Davies told BBC Sport that many current athletes "feel the same way" and that trans athletes should not compete in female events to "protect women's sport". 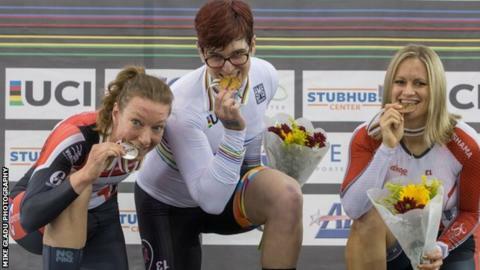 However, transgender cyclist Rachel McKinnon, who won a UCI Masters Track World Championship title in October, said Davies was "sharing hate speech". Athlete Ally - a US-based organisation that campaigns for LGBT sportspeople - cut its links with Navratilova in the wake of the 62-year-old's original comments, saying they "perpetuate dangerous myths". She was "sorry" for using the word "cheat"
She "stumbled into a hornet's nest" and got a "barrage of quite nasty personal attacks"
She wrote: "I know I don't have all the answers. I don't think there is a definitive answer here. That is why I want a debate, a conversation that includes everyone and is based, as I have said, not on feeling or emotion but science, objectivity and the best interests of women's sport as a whole. "Needless to say, I have always and will always be a champion of democracy, equal rights, human rights and full protection under the law for everyone. When I talk about sports and rules that must be fair, I am not trying to exclude trans people from living a full, healthy life. "And I am certainly not advocating violence against trans people, as has been suggested. All I am trying to do is to make sure girls and women who were born female are competing on as level a playing field as possible within their sport." Both Davies and Navratilova have called for sports' governing bodies to debate the issue. "So how do we go forward?" wrote Navratilova. "First, we all need to realise that there is no perfect solution in which nobody will ever be wronged or disadvantaged. "There is no blanket rule that will solve all issues. The objective must be to find policies that make women's sport as inclusive and fair as practically possible. Transgender women in sport: Are they really a 'threat' to female sport?